Giancarlo Stanton has gone crazy recently, hitting 32 home runs in 48 days. Last I checked, anyhow. It could be up to 36 by now, you never know with that guy. There have been many talks about his MVP consideration, as well there should be. However, Stanton is not the only guy in that Marlins lineup who is hitting the cover off the ball. Oh no, you have Christian Yelich raking behind Stanton, and then Ozuna behind Yelich. In the second half, Yelich is batting .295/.387/.530 with a .389 wOBA. Marcell Ozuna is batting .292/.378/.522 with a .379 wOBA. Both of these players are sitting high among the second half offensive leaderboards, Yelich 25th and Ozuna 34th. Together with Stanton, the oft forgotten Derek Dietrich, and JT Realmuto the Marlins have 5 of the top 112 batters in the second half, including 3 of the top 34 and, of course, numero uno. This is the offensive production the Marlins expected to see throughout the course of the entire season. Unfortunately for them, it took a few months for this to gel, in large part due to the relative poor performance of Christian Yelich in the first half. I am not saying Yelich was terrible, because he wasn’t. He was average in April and May. But Yelich isn’t on the team to be average, he is a core piece, and his performance over the past month and a half shows just how dynamic he can be for a ball club. In April and May, though, he was not hitting nearly as well as he is right now. So let’s see if we can find a reason. In the second half, Yelich has been more selective with his plate discipline, as you can see in the charts below. 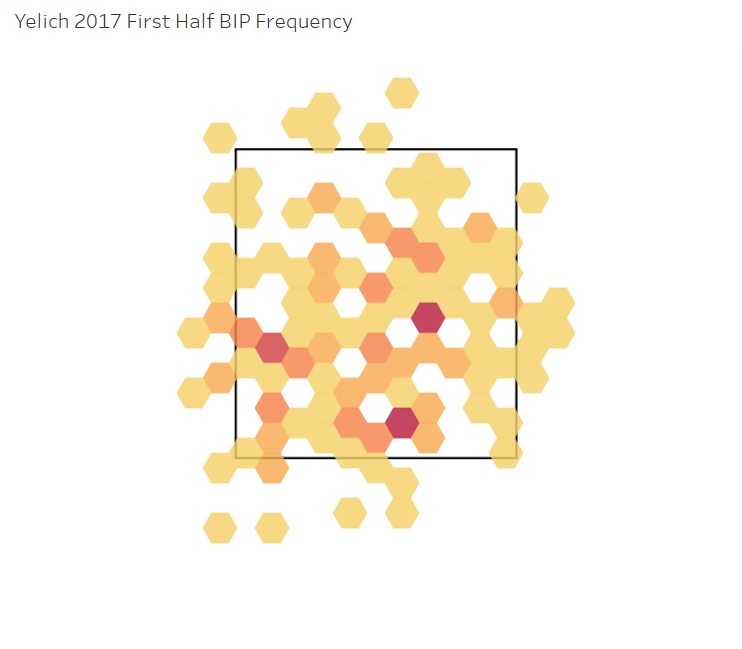 The chart on the left depicts pitch location for balls he put in play in April and May (which I erroneously labeled “First Half”), and the image on the right shows the second half. The more red the color, the greater the location frequency. In the first half (it is actually April and May) Yelich maintained great plate coverage. Inside, outside, up and down. For the most part he kept within the strike zone, venturing a bit on inside pitches and a half dozen or so around the knees. This is a reasonably disciplined strike zone, all things considered. In the second half, though, Yelich has clearly keyed in on a smaller area of the zone. He has largely given up swinging at the pitches in the top half of the zone and honed in on the middle, leaning a bit towards the bottom. He’s gone on a few more expeditions further outside of the zone, and those extremely inside pitches are some of the most extreme pitches he’s put in play over the course of the past three seasons. So, he is honing his strike zone down towards the middle of the plate much better than before, except when he decides to go further out of the strike zone than ever before. That’s weird, but all things considered, he is attacking the correct pitches much more often. 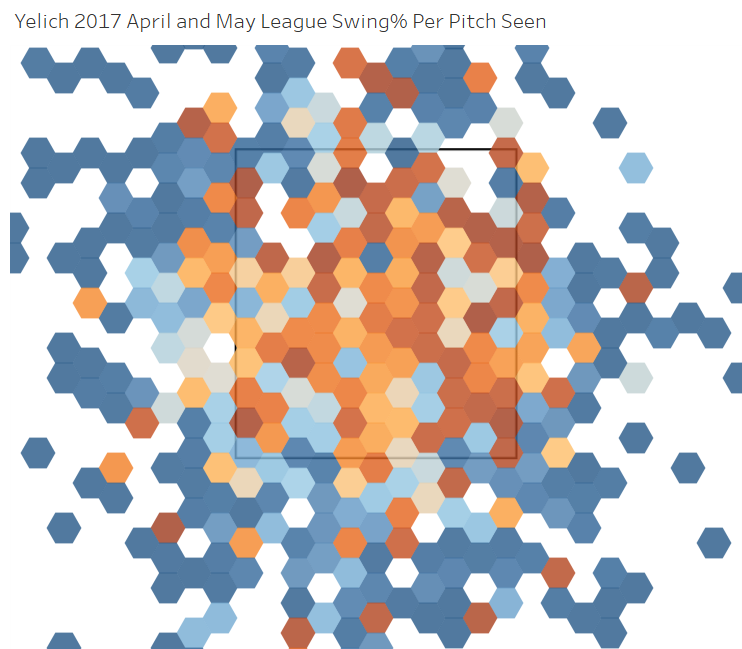 This next set of heatmaps shows league average swing rates for the pitches Yelich saw in this beginning April-May period and in the second half. Note, these swing rates represent how often the league attacked pitches that had a similar location and a similar velocity and similar movement. So, we can compare these league average swing rates with the contact rates from the previous charts to see how well Yelich is doing compared to the rest of the league when comparing similar pitches. 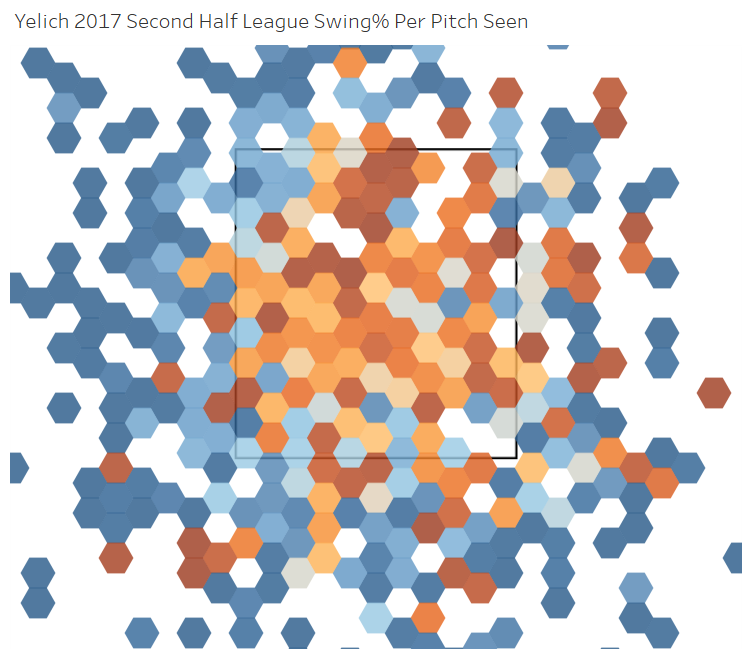 In April and May, pitchers were throwing enticing pitches all over the zone, and Yelich indeed attacked them where they were thrown. 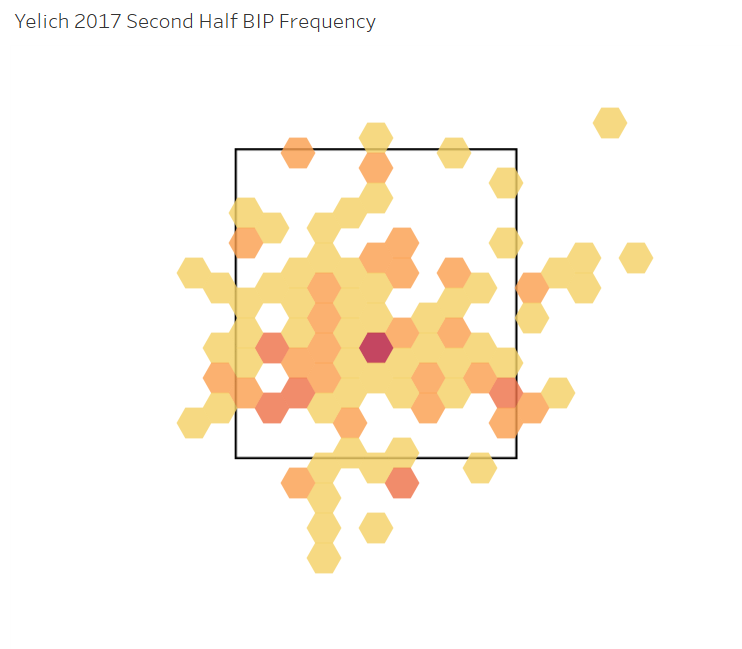 In the second half, pitchers are throwing Yelich more enticing pitches up in the zone, but Yelich is not making contact with them as frequently as he was doing so earlier in the season. We can deduce that Yelich is laying off pitches that the rest of the league is having trouble resisting. That could be a sign of maturity, or a mistake, depending on the circumstance. From a batted ball profile point of view, it is difficult to pin down exactly what has changed with Yelich. His exit velocity is roughly the same. The percent breakdown of his launch angles are the same as well. Roughly the same number of fly balls, pop ups, ground balls, etc. None of these have really changed. However, his average launch angle is down a tiny bit. Not very much, but a tiny bit. His weak groundballs, what I call dribble balls, are down, and his harder ground balls and low launch angle line drives are up a tad to make up for the difference. In other words, Yelich is hitting the ball a tiny, tiny bit more towards the flatter trajectories. As I have noted in the past, theoretical maximum exit velocity peaks around 7-10 degrees or so. If you hit the ball higher than 10 degrees, you’re sacrificing exit velocity. Which isn’t a bad thing, you don’t need that peak exit velocity to be a successful hitter, or to hit home runs. Sacrificing some exit velocity for angle is a good thing, for most batters. Indeed, many baseball players today actively seek to maximize their launch angle to their personal swing and bat speed. Yelich appears to have a lower ideal launch angle than most batters. There are two main reasons to lower your launch angle, from what I can tell. First, your swing. Second, your exit velocity. You may or may not have noticed, but many extreme power hitters in the game today tend to have a lower launch angle. Why? Because they hit the ball so ridiculously hard that their line drives are home runs. Stanton is an example of this. His average launch angle is only 12.5 degrees, but he produces such an insane amount of backspin on his batted balls that they can carry a very long distance. Other guys have lower launch angles because their swing lacks the qualities required to perform at higher angles. Guys like Billy Hamilton, for example. Hamilton has an average launch angle of 8 degrees, and more often than not he prefers to hit the ball into the ground and use his legs to beat out an infield single. As a result, Hamilton sacrifices exit velocity not to hit the ball into the air, but to hit it on the ground. He doesn’t have much exit velocity to begin with, so it isn’t a huge loss for him. Every batter competes to their strengths, and Yelich appears to be focusing in on his own. Yelich’s average launch angle is 4.6 degrees. That is low. There are only 14 batters with at least 200 batted balls who have a lower launch angle. The lowest average angle? Yelich’s teammate, Dee Gordon. Of all of these low launch angle batters, Yelich has the greatest average exit velocity, with 90.6 mph. Yelich provides his offensive value by hitting shallow line drives, which can go up the gaps or down the lines for extra bases. In fact, 6.4% of his batted balls this season have had a greater than 88% chance to go for extra bases (I call this VH%). The league average is 6%. In July his VH% jumped to 10.8%. For reference, Mike Trout is sitting around 10.5% this season. Yelich can hit these low angle line drives and hard ground balls, and rely on his speed to beat out base hits, or to turn singles into doubles. Remember, Yelich is one of the fastest sprinters in the game, ranked 36th on Baseball Savant. Of the players faster than him, many rely on this same sort of low launch angle approach. Dee Gordon, Billy Hamilton, Tommy Pham, and Trea Turner to name a few. Yelich appeared to have struggled in the past when he tried to elevate the ball a bit. He does have home run power, obviously. He will run into 20-25 homers per year, but it should not be his primary focus. Rather, Yelich is a line drive hitter who relies on spraying the ball around the field, taking advantage of the dimensions of his home ballpark, and using his speed to dominate the base paths. In time he may learn to turn on pitches in the same manner as Daniel Murphy, and if you watch Yelich long enough you’ll see he has latent power in his bat, but for the time being his greatest strength stems from being a high BABIP contact hitter. Let’s go back to the plate discipline. I’ve covered how balls low in the zone create ground balls, and those up in the zone create flyballs. I mean, you didn’t need me to cover that, it should be intuitive for any baseball fan but it is nice to backup intuition with data. Look at where Yelich is making contact: right in the middle of the zone. Balls in this area are going to be predominantly ground balls or line drives, but they also have the potential to be hard line drives and low fly balls (fliners, home runs, whatever you want to call them). In other words, Yelich’s plate discipline has honed in on his personal greatest strength. This is plate discipline in the truest sense. He is not hunting strikes, he’s not hunting pitches to hit. Yelich is hunting for pitches that fit his personal strengths as a batter. If he gets to two strikes, sure, he has to expand his zone. But fewer than two strikes, and this guy has tunnel vision the likes of which we have not seen from him before. He is evolving before our eyes, but it is being obscured by Stanton’s overwhelming success. We hoped you liked reading Yelich Lowered His Launch Angle, And It’s a Good Thing by Andrew Perpetua!